I normally don’t like to drive west of La Cienega. The fact that I did is worthy of a blog post (first one since April — apologies, readers!). On second thought, perhaps the purpose of my trip is a more worthy topic. When the progressive, design-savvy city of Santa Monica comes a-knockin’, you happily head toward the ocean and clean air, regardless of your penchant for staying landlocked in Silver Lake. 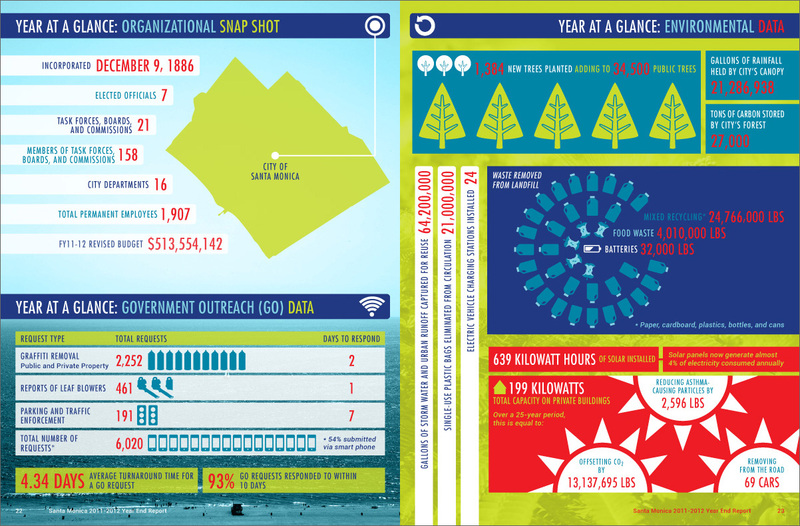 The project was to design the city’s annual report, highlighting its accomplishments in the 2011-2012 fiscal year. The underlying vision of promoting a sense of civic pride through compelling textual and visual narratives meant it was a pretty big, but inspiring, undertaking. The countless hours of layout and custom design work led to some insightful lessons in efficient work flow, collaboration and, of course, design. The Farm couldn’t have done it without the leadership and can-do spirit of Matt Mornick at the Santa Monica City Manager’s office. Matt also happens to be an awesome photographer and shot some beautiful images of the city specifically for this project. I mean, check out the show-stopping image spanning the front and back covers! I think the word you’re looking for is “wow.” Click image to view an enlarged version. 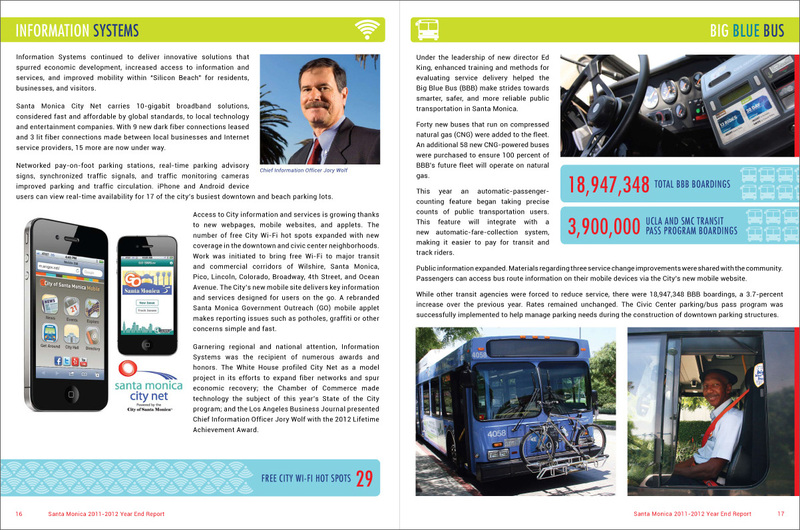 The report is being printed and bound as we speak and will be mailed out to Santa Monica businesses and residents next week. 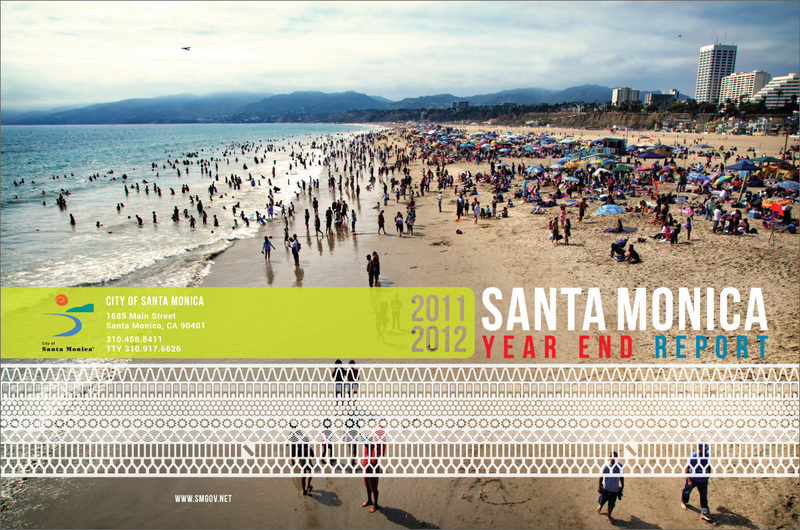 You can view a web-only version on the City of Santa Monica website. Be sure to check out Matt’s body of photography work: www.mornick.com.